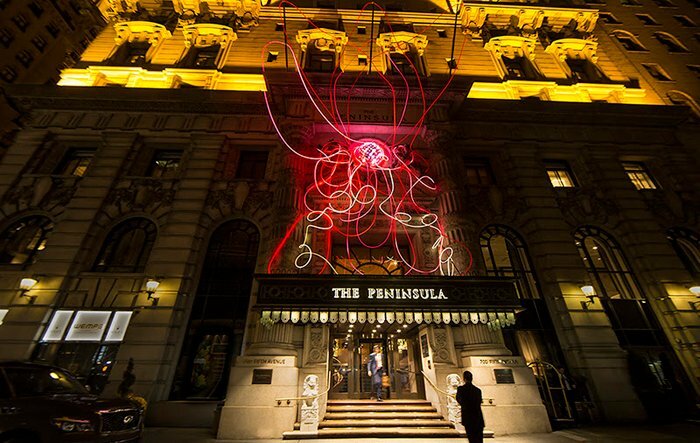 If you’re feeling fancy, head to The Peninsula for a pricey cocktail and to check out the gorgeous light installation by Grimanesa Amoros on the façade. Lower Manhattan’s Brookfield Place is being taken over by art and fashion this weekend, with interactive projects by fashion stars like Diane Von Furstenberg and Cynthia Rowley, paired with art stars like Olaf Breuning and Rob Pruitt. Take your art experience to the next level with fire, by catching one of Flambeaux’s performances at Hearts of Fire, or get schooled by artist Sarah Sze at Tanya Bonakdar. The new Seaport District is hosting a talk with author David Crabb, and Ridgewood is celebrating its new Night Market of fun. Finish off the weekend by experiencing Michael Alan’s Living Installation, an art-making, living-art party that helps to benefit the artist’s recent personal tragedy—a flood that took his home and art works. After a successful two-day show the other week (curated by me), Tim Okamura shows off his goods again along with Marcus Jansen, Ori Carino & Ben Armas, Jamel Shabazz, and Gregory Saint Amand in this great group exhibition. The glamorous old-New York hotel is adorned with the brilliant light work of Grimanesa Amorós in honor of breast cancer awareness. Give yourself an excuse to peruse this 1905 landmark if you haven’t before, while also checking out Amorós’ sculpture on the facade and throughout the hotel’s interior. A weekend of fashion and art experiences curated by David Colman and Visionaire’s Cecilia Dean. The free party starts Friday after work and includes interactive projects by Rob Pruitt, Ryan McNamara, Diane Von Furstenberg, Kate Gilmore, Italo Zucchelli for Calvin Klein, Olaf Breuning, Cynthia Rowley, and more. October 2-4, 8:00 p.m.-4:00 a.m. Yes, this is mostly a music and dance event, but the art performances are particularly noteworthy. 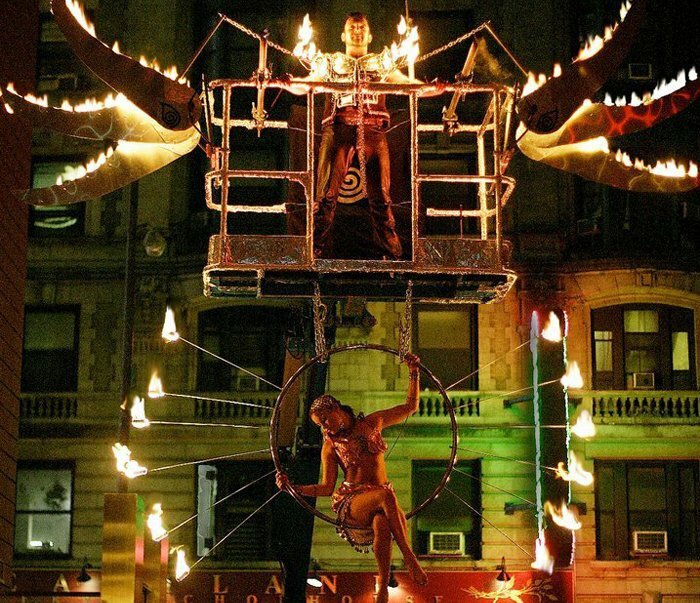 Appearing this year is the team of Flambeaux Fire, who incorporate giant sculpture with performance and…you guessed it, fire. They are truly a sight not to miss. 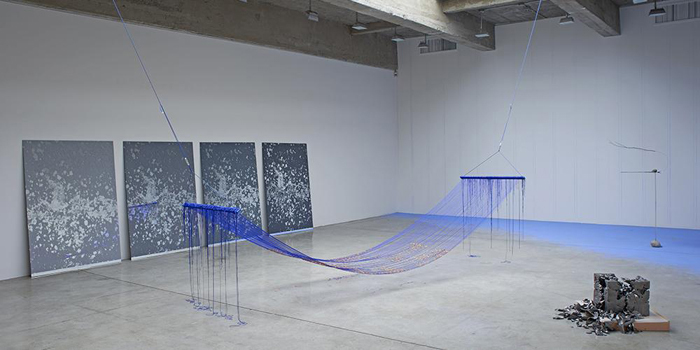 Get into the city before brunch, explore the sculptural works of Sarah Sze, and then get to know the artist in conversation with Russell Ferguson. Sze will have a permanent installation in the 96th Street subway station in the new Second Avenue line, expected to be completed in December. The newly revamped South Street Seaport Studios continue with innovative programming. Today, check out a talk with author David Crabb on his memoir about finding your true self. Totally free with RSVP. Get your night market on, this time in Ridgewood, and check out the wares of 40 local artisan vendors, as well as food, booze and music. Support local makers while also making an evening of it. Artist Michael Alan has made a name for himself with these living installation happenings, where a mix of art, creation and socializing meet. Alan’s models stand and pose while he paints them, while audience members either cavort and drink, or get inspired and sketch as if in a life drawing class. 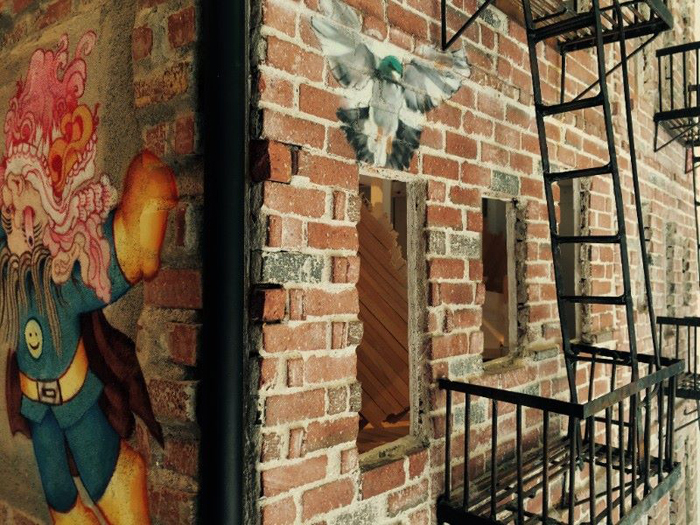 The installations usually take residence at unique apartments or interiors and bring together a certain kind of creative New Yorker not often found under one roof as of late. The event is ticketed however, but the proceeds will help Alan get back on his feet after an apartment studio flood took most of his possessions and art works.